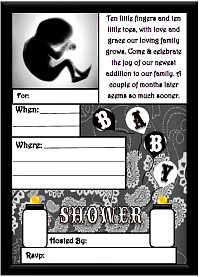 Printable pregnancy baby shower invitations for celebrating the welcoming of your little bundle of joy. 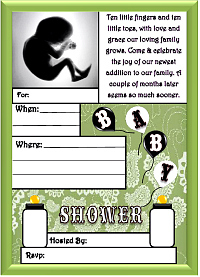 All invites seen on this page are themed around pregnancy, being pregnant, & the delivery of baby. 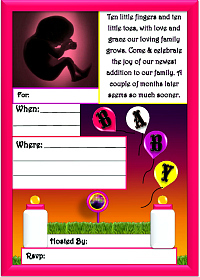 Some of these themed invitations contain pregnant people, embryos, fetus, & storks. All of our printable invitations can be viewed or printed by opening them in the Free Adobe PDF Reader program after purchasing. Your order will be sent instantly to your email address after you place an order for instant download invites. You can also add your own digital text to these printable by using Adobe PDF Reader. If you have any questions about how our printables work, Please View our FAQ List for more information.